"this is why events unnerve me"
I missed this until now, being rather bored with New Order since, er, well since 1983 actually. In that time there have been numerous compilations: Substance, The Best Of New Order, International, the boxed set Retro. So did we really need the release late last year of Singles, yet another anthology? Seemed like a calculated rip-off of an already saturated market. Oddly, the answer is "yes", we do need this record. Because Singles includes, in all it's original unadulterated heartbursting glory, the stunning "Ceremony". One of the last songs Joy Division wrote, "Ceremony" was premiered at their final concert. The performance at High Hall, Birmingham University on 2 May 1980 was made available on the posthumous double-album Still. Rough recordings from April or May 1980 capture the band rehearsing both this and a second track, titled "In A Lonely Place (Detail)"† when included on the excellent Heart and Soul boxed set. Soon after this came the death of Ian Curtis. The remaining three members of Joy Division renamed themselves New Order; their first act was to record and release the single of "Ceremony" backed with "In A Lonely Place". For this record Bernard Sumner took his first faltering steps in the role of vocalist, a task at this time shared by each of the band members in turn. 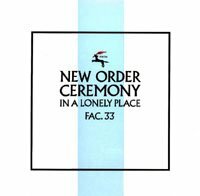 "it's got to be this time"
"Ceremony" was released in March 1981 on Factory Records as catalogue number FAC 33. The 7" is in a stamped gold-bronze sleeve, while the 12" cover was a completely separate design: roman lettering on a green background. Both of these were of course designed by Peter Saville, a name firmly linked to the aesthetics of these groups. The production was by Martin Hannett, also well known from Joy Division releases. Then, for some reason, the song was re-recorded with Gillian Gilbert on keyboards, just before she formally joined the group. 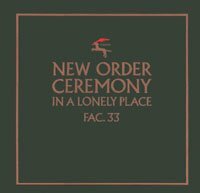 That version of the single was re-issued in 12" format only, in September 1981, with the same catalogue number. The sleeve was changed to a light cream with a vertical blue stripe, though with the same motif and typography as the original 12". After supplies of this sleeve ran out, copies of the original cover were substituted. 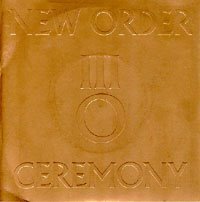 Thus (contrary to some reports) if you buy the 12" it is not possible to tell which version of "Ceremony" you will get, based only on the cover design. The only way to be sure is to read the run-off groove on the a-side of the vinyl itself. The original says "Watching love grow forever" while the re-release says "This is why events unnerve me". Both are lyrics from "Ceremony". There are significant differences in the recordings. The original is approximately 4:34 in length while the re-recording is 4:23. The original has a much more "Joy Division" sound, with throbbing bass, distorted guitar, and solid drum kit contributing a wash of cymbals. In the re-recording the bass is diminished, cymbals restrained, and vocals less dramatic and quieter in the mix. The guitar has a sound typical of that used on the album Movement. Drum hits in the opening verse are dramatically panned in the mix. There is a greater contrast between verse and chorus, with the latter sections reaching some of the emotional pitch of the original recording. The re-recorded version was used on all subsequent compilations until the aforementioned 2005 compilation Singles, which also includes two other early tracks previously unavailable on CD in their original 7" single versions: "Temptation" and "Everything's Gone Green". Those without access to vinyl can now hear one of the most chilling, resounding, achingly beautiful hymns to lost experience ever penned. This is a song that can make grown men break down and cry, as it did one music critic upon release. For one shining moment in 1981 it seemed like the naive romanticism of Ian Curtis might continue into the future. As I suppose it did, for a while, through to the Power, Corruption, And Lies album, though not in any way we might have envisaged. But back to the record. At the two-thirds mark the bass tries harder than ever to break free of the contraints of the grooves. Guitar shards chime and echo around that frail voice, never quite up to the task. The final lines then usher in a resounding refrain that is full of "yes, yes, yes" and fate and destiny too. That's worth cherishing. So get this record. Now. †This recording sounds as though it is sourced from a cassette tape that has been deliberately erased just prior to a delicate lyric in the song. I have adapted this article as a wikipedia entry. I will say more about another New Order rarity in a future post. Lyrics by Ian Curtis. © Deborah Curtis, 1995. Confusion seems to be a quite rare version as well or am I just not looking hard enough? I searched the disco's at www.discogs.com and www.niagara.edu/neworder/ but I haven't found anything similar in length and it's not the same version as on 'Substance'. Someone know anything about it? "Confusion" on the Singles compilation is an edit of "Confusion Rough Mix" from the original 12". That's why the times don't match. This still leaves "Confused Beats" unreleased on CD.